Currently, there are three kinds of philosophy gift sets sold in a luxurious cardboard tube: vanilla birthday girl, the cocktail party, and thank you. 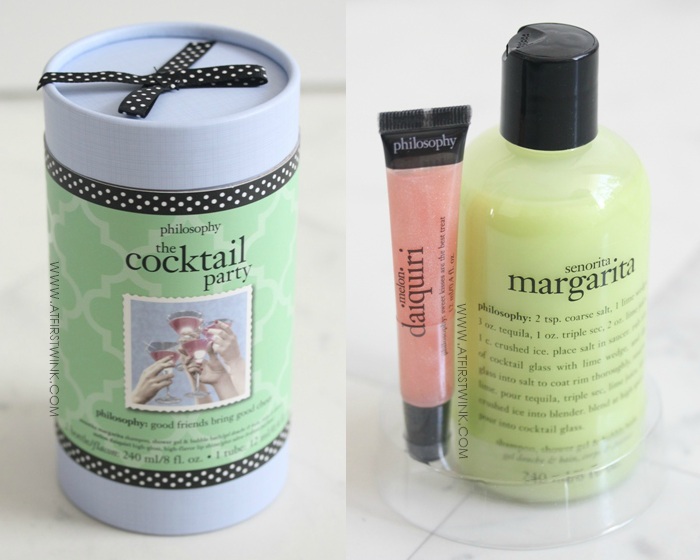 The gift set that was sent for me to review is the cocktail party. It is the only gift set amongst the three that do not have a matching scent. 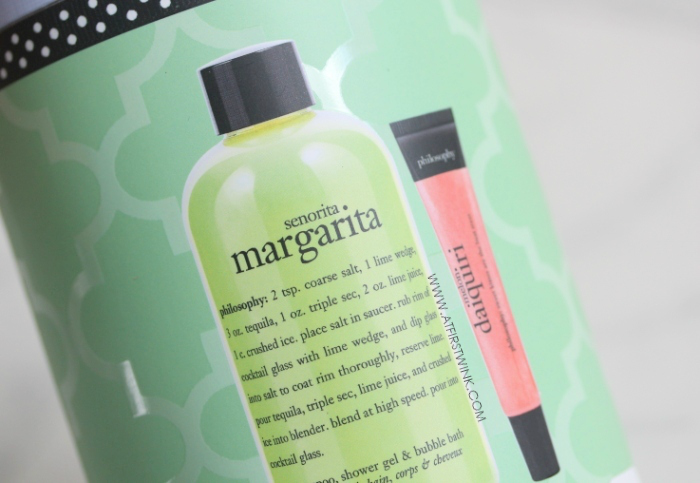 It contains a 240 ml bottle of the philosophy senorita margarita shampoo, shower gel, & bubble bath and a 12 ml tube of the philosophy high-gloss high-flavor lip shine in the melon daiquiri flavor. The two philosophy products are very tightly secured in a transparent, plastic support and it keeps them in place very well. Turning the tube upside down and shaking it, did not make the products come off. You could keep using it to store the two products. Since the support is transparent, it should fit in any interior. The cardboard tube can also be re-used to store long items, such as make-up brushes in. Even though it is a cardboard tube, it has very luxurious details, making it impossible for me to throw it away. There is a glossy finish on the patterns and the picture on the front and the ribbons on the sides look totally real even though they are just printed on. The only polka-dot ribbon that is real is the bow on the cap. Now, let's look at the two philosophy products in the gift set. 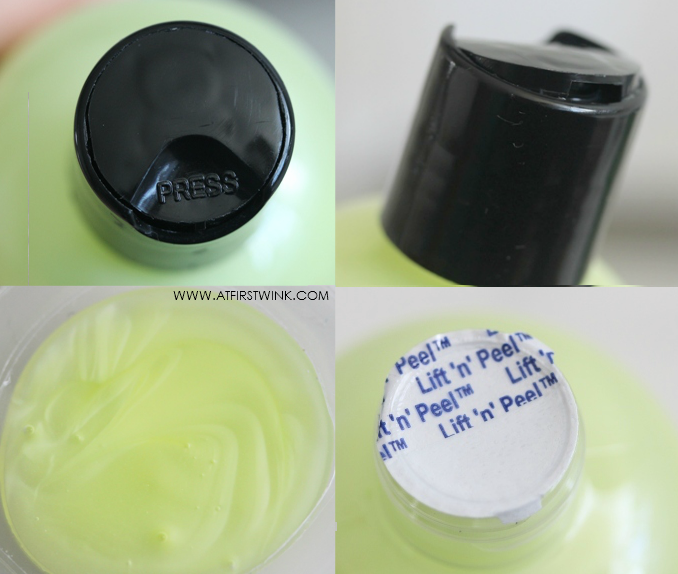 It has a very pretty, lime green color and a pearly finish that is similar to shampoos. I really how it smells as it has a sweet 7-Up, lime Skittles scent with a hint of alcohol. I don't really like the cap as the part that goes back in, gets very dirty from the leftover (dried) shower gel and I need to squeeze the bottle to get the product out. I am now used to using a pump to dispense my favorite shower gel and it is very handy. So in comparison, this is a step backwards. Just to make sure you don't make the same stupid mistake I did: there is a protective foil in the inside of the bottle, so you need to remove that first, before you can squeeze the shower gel out. I don't have a bath, so I could only test it as a shampoo and shower gel. First off, it made my hair very clean, voluminous, and straight (I have naturally wavy hair). You only need to use a little bit for it to foam up and it also covered my hair with a hint of sweetness. I expected it to make my hair heavy or sticky, but that really wasn't the case. However, it did make my hair a bit frizzy. Unless you are really short in time in the mornings, I think you should stick to your normal shampoo. As a shower gel, it performed quite well. My skin felt moisturized and soft. It is not that different from the shower gel that I normally use, but I really enjoyed the nice scent in the shower. I can also still smell a hint of sweet lime on my skin afterwards. I also tried creating lots of foam with it and it was very airy (visible small bubbles) and dense. It feels very creamy on the skin and it seems to cling better onto the skin than normal foam. I took about 5 min. to take a good picture of the large clump of foam resting on my hand and the foam strangely didn't fall off. It also didn't diminish until after a long time. From this, I can tell that it would be great to create a bubble bath with. First, I found out that the color isn't as pink as in the promotional pictures. 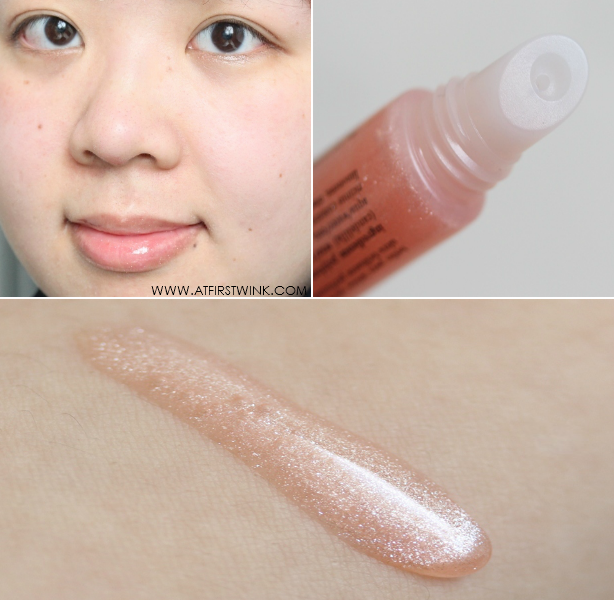 It barely gives off any color on my pigmented lips, so it is better to see this as a sparkly, transparent lip gloss instead. The enormous amount of silver shimmers also scared me off a bit, but the shimmers do not look as visible on the lips as in the tube. There are also some multicolor shimmers mixed in, which are more noticeable at night. This philosophy lip shine has a sweet water melon scent and taste. It kind of feels like covering your lips with a sugary syrup, as it transfers onto the food that you eat, making everything taste sweet. To remove the swatch that I made on my arm (see picture above), I tried using water and also water with soap, but it didn't come off. In the end, I needed to use cleansing oil to remove the stickiness. Although it felt very sticky on my arm, it surprisingly felt very light on my lips. There isn't a heavy feeling, that continuously remind you that it is there. When you apply a thin coat, it doesn't feel that sticky, unless you press your lips together very hard and release them. I got used to the sticky lip gloss from Peripera, so this is nothing in comparison. The slight stickiness also makes it last a bit longer. When the gloss fades away, the shimmers that are left over don't look that flattering on the lips, so it is wise to touch up once in a while. Because of my pigmented lips, I definitely would have preferred more color, but it does make my lips look very nice and glossy. I think it would look great paired with a lip tint. Update: I have worn the lip shine over lip tint in this post. In the Netherlands, the three philosophy gift sets (retail price: €30.55) are exclusively available at the ici paris xl stores. Currently, they are discounted to €27.50 in the online store. They would be really nice as a mother's day gift or as a treat to yourself.